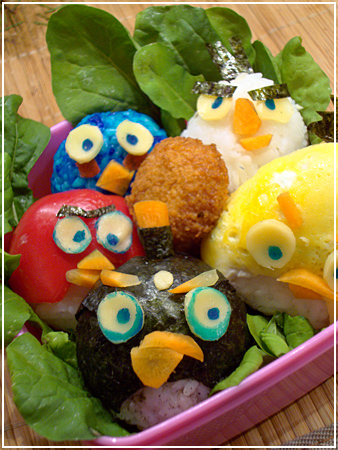 This bento is angry! And it’s gonna kick your a**! OK, so I don’t even play the game but I couldn’t withstand the visual possibility yesterday when I saw the different ball-shaped and triangular characters – they were just screaming to be made into onigiri. And yes, that’s a whole lot of rice. I don’t care :) I put some falafel in the middle to have something to balance it and will be taking some furikake and some soy as well. Black bird: Rice with ground black sesame, nori. Red bird: Bell pepper and plain rice. Blue bird: blue food coloring. I haven’t posted many bentos as of late. The reason is simply that with winter and lack of light, I’m just usually too tired to make anything and when I do, they feel uninspired and rushed. This one isn’t quite as interesting either – just leftover oven potatoes with hardboiled egg, a homegrown mini pepper and rucola, and a Hello Kitty packet of raisins for dessert. 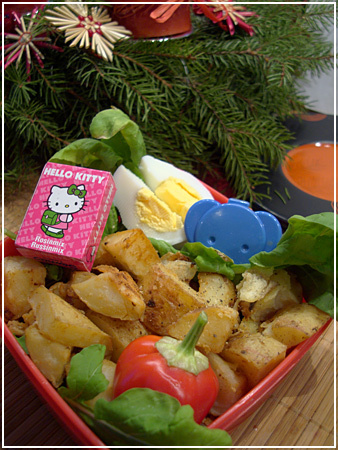 Those packets are so cute, perfect for bento! With Christmas approaching rapidly there’s a lot of chocolate in the office so I thought bringing something healthier for dessert would be a good idea. Here’s a picture from this morning on my way to work with beautiful sundogs. They’re caused by ice crystals in the air and this week, we are getting them nearly every day! They are quite spectacular to look at, even if it means standing around in the cold. When I went out on the platform to take a picture, I noticed a lot of other people were doing the same. :) These days, everyone is a photographer!